An Ancient Solar System...: Where is the biggest man made structure? If we're talking about huge things built by people the knowledgeable among you will be pointing to the Three Gorges Dam, or the Burj Khalifa. If we include things composed of many interlinked structures you might well point to the worlds great cities: New York, Baghdad, Tokyo. Then there are road networks: The worlds largest road network is America’s, at over six million kilometres long... Pretty impressive, but there is a very large structure built by humans, which is not only bigger than a city, but bigger than our entire planet - and almost perfectly circular: The geostationary satellite arc. Above: A map of the geostationary arc (and a bunch of other satellites too). 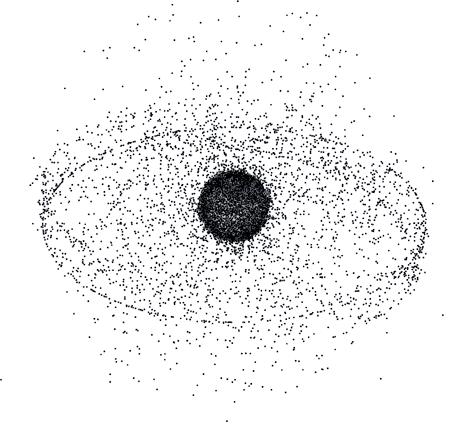 The arc is a ring of satellites in the most prized of all orbits, geostationary orbit. Here a satellite will take 24 hours to orbit the Earth once – so, in effect, it hangs motionless in Earth’s sky. That’s a pretty useful property to have, whether your space platform's job is communication, navigation, surveillance, weather monitoring, or… well, anything. Famously made known by Arthur C Clarke, this magic orbit only has limited space , and satellite operators pay heavy fees for a slot in it. The satellites there hold a huge, co-ordinated ring formation 35,786 km above the Earth's surface, encircling it. Above: The view from one point on the arc, the Echostar 11 satellite.